If you can't part ways with the heavy drinking habits of young adulthood, it may catch up to you sooner than you think. 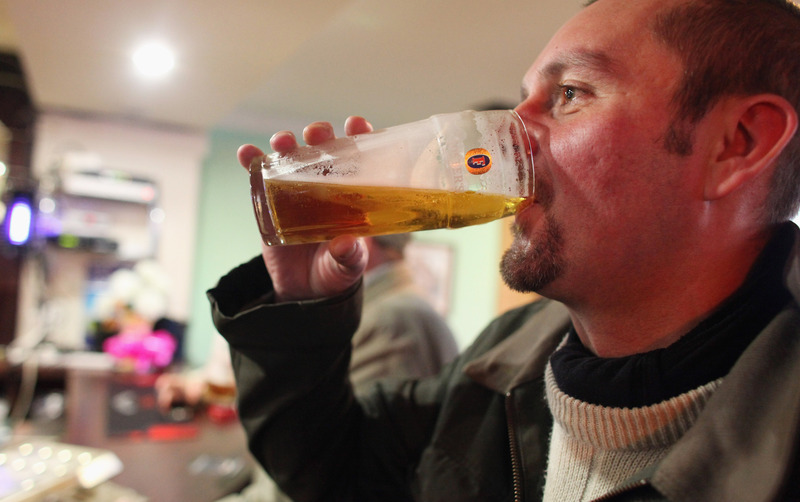 A British study suggests that men who drink heavily may lose memory and reasoning skills during middle age. Heavy drinkers decreased their cognitive abilities like reasoning by about two years, and lost six years for memory, compared with counterparts who imbibed moderately or not at all. The study, which was published Wednesday in the journal Neurology, looked at about 5,000 British men and 2,000 British women over 20 years. It found that mental decline was worst for the heaviest drinkers, who consumed the equivalent of 30-90 ounces of beer per day. Yikes. But since that is such a wide range, the people who drink the lesser amounts may not necessarily be at such a high risk, says Sara Jo Nixon, a substance abuse researcher at the University of Florida in Gainesville. But experts like Simon Ridley, head of research at Alzheimer's Research UK, warn that even if the effects of heavy drinking aren't noticed right away, it could lead to danger down the road. "These latest results could serve as one more reason to stick to any new year's resolutions to cut back on alcohol. ... The people in this study did not have dementia but memory decline can be a precursor to dementia and understanding the risk factors for this decline could be important for preventing the condition." So ... what about women? The study monitored some heavy-drinking females, but there were not enough to determine any similar cognitive results as the men of the group. A 2012 British survey found that middle-aged women are now drinking more than Millennial females, putting themselves at risk of strokes and cancer. And in the U.S., the CDC revealed that 14 million American women binge drink about three times per month. Even though most of them are between 18-34 years old, drinking habits could possibly extend into middle age. Alcohol is already linked to increased chance of breast cancer, stroke, and pregnancy problems. Remember: Everything in moderation. You don't want to end up in one of the drunkest towns in America.